Audio and architecture—at first glance, the two fields couldn’t be more opposite. Audio is invisible; you can’t really see it, touch it. For most people, it only excites one of the senses–hearing. Architecture, on the other hand, is all about the built environment. You can see it and feel it, but you can’t really hear it, and it makes no sound on its own. 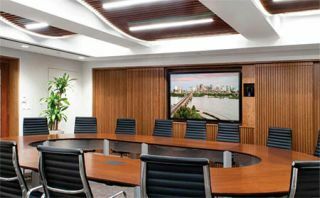 In this corporate boardroom, Soundtube RS500i open-ceiling loudspeakers are suspended from the structure, above a wood grille ceiling. Since the loudspeakers are black and the backing for the ceiling system is also black, they are essentially invisible. But in fact, the two are inextricably connected, and have been linked in history for at least 2,500 years. The first Greek theaters were outdoor spaces built to accommodate as many as 14,000 people. The challenges of visual sightlines and acoustics were masterfully addressed by these ancient architects; in fact, it’s astonishing how many of the practices originated back then are still in use today. A few thousand years later, Marcus Vitruvius Pollio codified many of these practices in one of the first books on the subject, De Architectura, which appeared around the first century BC. Left: Ancient Greek theaters were built to optimize both sightlines and sound. Concentric circles were clearly a design element of ancient theatres for optimizing sightlines as well as sound transmission. It’s not exactly clear when theaters first became enclosed, but once they did, a whole new set of challenges confronted theatre designers. Obstructions, like walls, ceilings, and structural support elements, create surfaces from which sound is reflected or absorbed (depending on the material)—making sound transmission far less predictable and potentially problematic. Fast forward through the Dark Ages another 2,000 years (during which virtually no new knowledge was added to the field of acoustics) to Harvard physics professor Wallace C. Sabine. Sabine was charged with the responsibility of addressing the acoustic problems in the Fogg Art Museum’s lecture hall in Cambridge, MA, built in 1894. The 400-seat room retained the time-tested shape of the ancient outdoor Greek theatre, but was enclosed with a domed ceiling and walls of hard plaster, furnished with and wood seats and flooring. The problem was that no one could understand lecturers at the front of the room, since sound would reverberate for over 5 seconds and render all speech unintelligible. Below: A whisperer at one end of the catwalk inside the 30-foot diameter Mapparium can be easily heard at the other end. Over the next several years, Sabine’s research in this real-world laboratory produced the foundations of what we now call “architectural acoustics”. His work led to the first real understanding of how different materials absorb and reflect sound, and enabled future acousticians to predict and use the behavior of sound in purposeful ways, as a design element. One example of purposeful design occurred just across the street from Sabine’s next acoustical triumph (Boston Symphony Hall) at the world headquarters of the Christian Science church in the Mary Baker Eddy library. Inside the library is a thirty-foot colored stained-glass globe called the Mapparium, which was designed by architect Chester Lindsay Churchill of Boston and built in 1935. Visitors can walk through the center of the structure, viewing the world from the inside. But it’s the acoustical effect that is nearly as stunning as the visual one. “The Mapparium is a symbol of the mission of the Christian Science Monitor, the famed publication of the Church,” said Stephen Graham, Communications and Content Manager for the Mary Baker Eddy Library. “Like the Monitor, it has an international focus, and its visual and auditory effect is designed be consistent with this mission—to ‘unite the world in a shared vision’ as you stand and speak inside it.” The Mapparium is known as a “Whispering Gallery” because of the unusual effect of sound reflection from the globe’s 608 individual stained glass pieces; a person whispering at nearly inaudible level at one end of the globe’s suspended catwalk can easily be heard by a listener standing 30 feet way at the other end. Above, Stealth Acoustics’ dual 8-inch subwoofer can be completely concealed behind standard drywall. Pictured below, Beale Street Audio's In-Ceiling Group of speakers. Whispering galleries have been around for centuries, if not millennia; one of the earliest examples is the “Ear of Dionysius”, which dates back to ancient Greece on the island of Sicily near Syracuse. This limestone cave creates a remarkable acoustic characteristic that enables a listener standing at the top of an open “grotto” to hear whispered voices at any location at the floor of the stone structure, 74 feet below. According to legend, Tyrant Dionysius (circa 432 – 367 BC) designed this area as a prison, and used this characteristic to his advantage to circumvent uprisings, since he could eavesdrop on prisoners and hear every spoken (or whispered) word. It’s been debated whether the structure was a natural accident or carved by man, but either way, it serves as ancient evidence of how sound can be used as a design tool for a specific architectural purpose. In residential environments, sound is often used in the aesthetic design of a living space. But in commercial applications, despite an abundant body of knowledge of acoustics in built spaces, it’s interesting that the use of sound as a design element is not more prevalent. Sound is more likely to be utilitarian than artistic; a “must-have” to support the visual sense, instead of an equal partner in an integrated sensory experience. In home environments, a musical instrument often serves as design element. In most cases, sound technology is meant to be heard and not seen, and manufacturers like Mount Vernon, WA-based Stealth Acoustics continue to strive to offer products that support this objective. One of the biggest challenges in hiding sound technology is the fact the creating low frequency sound requires moving a lot of air, which generally means large loudspeakers or subwoofers. Higher frequencies, on the other hand, can be reproduced by much smaller transducers. A common method of managing the challenge is to separate the lows from the highs, and “hide” the larger low frequency component in a ceiling or wall. Bose Panaray MA12EX column loudspeakers are hidden behind blue grille cloth attached to aesthetic millwork near the pulpit in the Thorncrown Chapel. When visual aesthetics are extremely critical, like historic spaces and houses of worship, sound can be hidden or even camouflaged among physical architectural design elements. At 48 feet tall with over 6,000 square feet of glass and a flagstone floor, the Thorncrown Chapel in Eureka Springs, Arkansas is one example of what one might call an acoustician’s nightmare. With highly reflective surfaces and strong restrictions on what could be done to improve speech intelligibility, the sound reinforcement system relies on highly directive loudspeakers from Bose Corporation, to direct sound to listeners and not the reflective surfaces. “This is an architecturally and historically significant building, so a lot of care had to be taken installing a sound system,” said Mark Labouff, National Sales Manager for FBP Systems, a systems integration firm based in Tulsa, OK. “The architect had designed millwork to hide speakers when the building was first built. In order to maintain the historical integrity of the building, we needed a speaker system that would fit inside the original millwork, and the Bose Panaray MA12EX modules were the right size; they are actually hidden behind blue grille cloth that spans the front of the millwork. In addition, because of where the millwork is located, the speakers had to be placed behind the pulpit microphones. That creates an enormous potential for feedback. But with the MA12EX loudspeakers, it was no problem. The MA12EX loudspeakers are resistant to feedback, and have such tight pattern control that I can’t imagine any other product could work in that space,” said Labouff. If a project requires audio technology to be installed directly into millwork, or a structure with historic value/appeal, maintaining fidelity to the original design is paramount. Mark Cichowski, executive director of Beale Street Audio and Sonic Vortex, explained his product’s approach to this common challenge. ”The integrated enclosure of the Beale Street Audio speakers will allow for a significant amount of flexibility in the placement since it does not depend on the cavity behind the speaker for sound quality,” he said. “The integrated enclosure of the Beale Street Audio speakers uses our patented Sonic Vortex technology, which forces air through internal ‘fins’ at a high velocity.” The effect, he said, is rich bass and noticeable clarity in a compact space. Cichowski added that ceiling cavities often vary from where one speaker is installed to another, which makes each speaker sound different. “The Sonic Vortex enclosure guarantees consistent sound from each location,” he said. Mark R. Mayfield is an audio engineering veteran, cinema marketing manager, and frequent contributor to AV Technology magazine.